...... RSS. 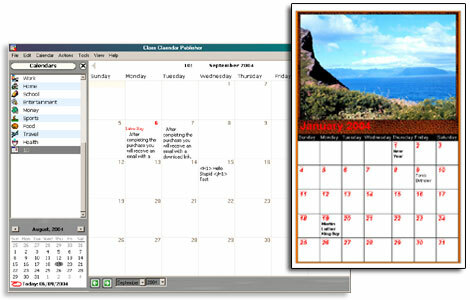 Makes a perfect calendar for a business, school, church, club, organization or team. The calendar can be easily linked to, embedded, or popped up from your website because calendar pad uploads standard html files to your web server. * RSS Feed Visitors can subscribe to upcoming events using and RSS reader. * Easy to update! Builtin FTP makes updating your calendar easy. It transfers your file attachments too. Help you create monthly web page calendars instead of encoding them manually. Qweas is providing links to Web Calendar Pad 2012.1.4 as a courtesy, and makes no representations regarding Web Calendar Pad or any other applications or any information related thereto. Any questions, complaints or claims regarding this application Web Calendar Pad 2012.1.4 must be directed to the appropriate software vendor. You may click the publisher link of Web Calendar Pad on the top of this page to get more details about the vendor.